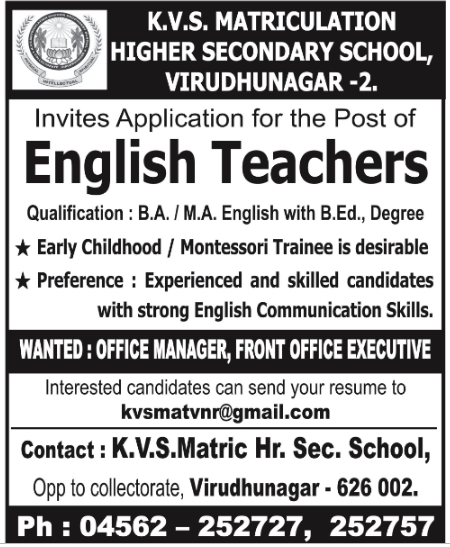 KVS Matriculation Hr.Sec.School, Virudhunagar has advertised in the DINAMALAR newspaper for recruitment of Teachers jobs vacancies. Interested and eligible job aspirants are requested to apply immediately from 03rd February 2019. Check out further more details below. B.A / M.A English with B.Ed / Degree. Early childhood / Montessori trainee will be desirable. Experience and skilled candidates with strong English communication skills will be preferred. How to Apply: Interested candidates are requested to send application with their detailed resume along with copies of certificates and recent PP size photo to the email address mentioned below.